The geology within and around Durness is rather complex with an impressive range of sedimentary and metamorphic rock types for what is only a small area. It is located within the North West Highland Geopark, one of the finest regions of the world for understanding geology, particularly mountain building processes. This is largely due to a major thrust fault known as the Moine Thrust. This carried a large thrust sheet of 'Moine ﻿Schist﻿' with some underlying ﻿gneiss﻿ over a Caledonian Foreland of Lewisian Gneiss, quartzite & Durness Limestone during a period of ﻿Caledonian mountain building﻿ ~430 million years ago. By disturbing foreland sections immediately below the main thrust, it created a 'zone of complication' referred to here as the Moine Thrust Zone. The Moine rocks and related thrust simply take their names from the extensive A' Mhoine blanket bog area which sits upon the impermeable schist between Durness and Tongue. Fig 2: Present day layering of the Durness rock units with locations at which they can be seen (not to scale). Most of Durness village lies on a thick (up to ~800m) succession of dolostone and limestone rocks that were deposited along the margins of the Iapetus Ocean during Cambrian and Ordovician times (510-470 million years ago). This sequence is informally known as the 'Durness Limestone', although dolostone makes up the majority of the sequence. These rock types are quite rare across Scotland and therefore so are features such as freshwater caves, limestone pavements and shakeholes, all of which can be found around Durness. This underlying geology with it's high levels of calcium carbonate has also resulted in the Durness area being one of the most fertile areas in northern Scotland, partly why it shows evidence of very long term human occupation. Geologists have broken the Durness Limestone down into seven stratigraphic intervals (known as 'formations') based on the different appearance of the rock throughout the sequence, most of which are named after places in the Durness area where they are best preserved (e.g. Eilean Dubh, Sangomore, Balnakeil). 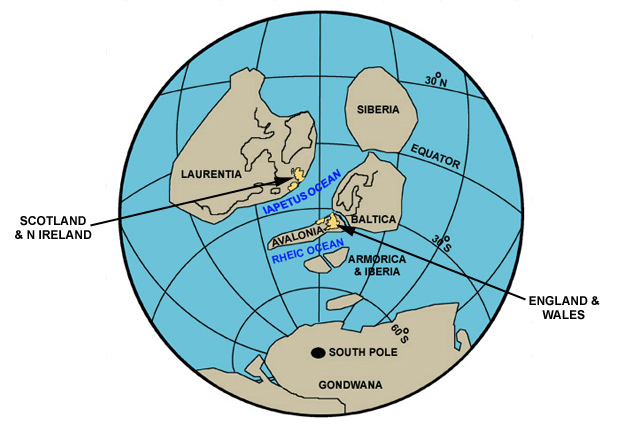 This is linked to slightly different depositional environments through time, controlled by fluctuations in relative sea level over a warm marine continental shelf. Smoo Cave has formed at the boundary of two of these formations; the pale grey dolostones of the 'Sangomore Formation' and the underlying, darker dolostones of the 'Sailmhor Formation'. The Sailmhor is characterised by an odd mottled appearance which gives it the informal name of 'Leopard Rock' and pebbles of it (sourced from the Geodha Smoo cliffs) litter the entrance to Smoo Cave. It is unclear as to what exactly has caused this mottling although ancient burrowing and recrystallisation of the sediments have been suggested by some geologists. It also contains abundant nodules of ﻿chert﻿ where carbonate minerals have been chemically replaced by silica. Fossils within the Durness Limestone are relatively rare (partly because of dolomite recrystallising the original limestone rock) but those still found such as small cephalopods, gastropods and sponges were exceptionally complex for their time, even if they may seem underwhelming today. These lived relatively shortly after the Cambrian Explosion when all life was still restricted to water. The sequence is extremely abundant in algal structures such as stromatolites and ﻿thrombolites﻿ however. These increased oxygen levels within the Earth's atmosphere at the time through photosynthesis, encouraging rapid evolution to continue. Due to the tilted sedimentary strata of the Caledonian Foreland area (quartzite and Durness Limestone) rising to the west and high levels being eroded away, it is usually only the deformed Durness Limestone which was caught up within the main Moine Thrust Zone to the east which has been preserved across the NW Highlands. This complex zone (which contains numerous thrust faults) outcrops along a narrow NE-SW belt from Loch Eriboll to Skye, passing through Assynt where Scotland's main caving region is located (﻿map﻿). The Durness region is unusual in that it not only has a thick 10km long wedge of Durness Limestone exposed across the area west of the thrust zone (i.e. the foreland area), but also isolated sections of the Moine Thrust Zone and Moine Thrust Sheet. It is paradoxical of course that foreland rocks should be seen as 'unusual' across the foreland area. This wedge is the result of a large, localised geological feature known a ﻿half-graben﻿ ('graben' being the German word for ditch / trench). Here the Durness Limestone and the deformed rocks of the overlying Moine Thrust Zone and Moine Thrust Sheet have been dropped downwards by major faults such as the Leirinmore Fault, highlighted in Figure 4. A more detailed cross-section of the half-graben structure can be found here. Previously these rocks would have been found several hundred metres overhead (potentially higher than 2km) and extended several kilometres across to the Loch Eriboll area where part of the Durness Limestone sequence is also found. Other continuations of the Durness Limestone can also be seen in Greenland, Newfoundland and the Appalachian region - a reminder that northern Scotland is ﻿geologically part of North America﻿, only 'recently' separated due to the opening of the North Atlantic Ocean ~60 million years ago. Not only did this down-faulting at Durness save most of the Durness Limestone and some overlying sections of thrust zone from erosion but it also placed it side by side against much older and harder Lewisian Gneiss (which takes it's name from the Isle of Lewis where the same rock type is found). After the recent period of glaciation which differentially eroded the Durness Limestone, the result is a notable mountain escarpment of gneiss which runs parallel to the Leirinmore Fault from Beinn Ceannabeinne to Cranstackie. This in turn means that most rainfall which falls onto these local hills quickly flows off of the impermeable gneiss and down onto the limestone lowlands area where Smoo Cave is located. The Ceannabeinne to Cranstackie escarpment of Lewisian Gneiss running parallel to the Leirinmore Fault (which forms the edge of the sedimentary wedge). LAMBERT, R, & HOLLAND J. 1972. A geochronological study of the Lewisian from Loch Laxford to Durness, NW Sutherland, N.W, Scotland. Journal of the Geological Society, v. 128. TREWIN, N. H. (ed.) 2002.The Geology of Scotland,: 4th ed. WILSON, R.W. et al. 2010. Basement-influencing rifting and basin development: a reappraisal of post-Caledonian faulting patterns from the North Coast Transfer Zone, Scotland. Geological Society, London, Special Publications, 335.